If NHL 94 is considered to be the hallmark of the series, then NHL 95 is the red-headed stepchild. 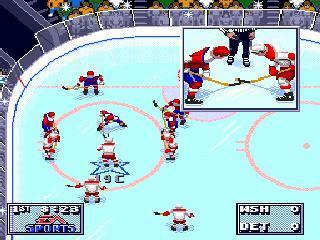 Fans of the NHL franchise consider this game to be the low point of the series on the 16-bit platforms. EA chose to take the series in a slightly new direction by speeding up the game play. I personally welcome this change as I felt that the previous games were a bit slow, and the skating rather unwieldy. The game finally has a few new tunes for the organ player, and fans of the Madden football franchise will recognize the grunting sounds that the players make as being recycled from that series. The game features a couple of new game modes. Practice mode let’s you play one-on-one against a goalie, which I guess helps you practice breakaways and penalty shots (I didn’t think it was fun at all.) It is also finally possible to play through a complete season, which was long overdue. For some reason the developers chose to remove game stats from the in-game menu, so it is no longer possible to check stats such as shots on goal and breakaways, which I find highly annoying. The problem with this game is simply the core game play. This game has terrible passing and bad AI (yes, worse than the previous games). Trying to get the puck to your intended recipient is a real chore, and your team mates never seem to be in the right place. Because of these problems, it’s very hard to generate goals, and it’s not uncommon to skate to a 0-0 tie. This game is not the horrible disaster that some make it out to be, but I can definitely see why it was a huge disappointment back in the day. NHL 95 is definitely a step backwards in terms of game play, but the new features help modernize the series and carry the franchise in the right direction. Buy NHL ’95 on GameGavel or Amazon. Tagged genesis, Hockey, NHL '95, Review, sega, Sports. Bookmark the permalink.